Beverly May Smith, 86, of Iowa Falls, formerly of Raymond died Friday November 9, at Hansen Family Hospital in Iowa Falls. She was born January 8, 1932, in Britt, the daughter of Lester and May (Peterson) Johnson Michelson. She married Vernon Smith June 28, 1950, in Garner. He died in 1987. 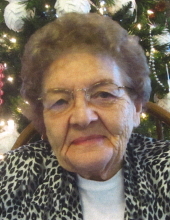 Beverly graduated from Britt High School in 1949 and was employed with Great Plaines Gas and Joe Thome Trucking as a secretary before retiring in 1989. Preceded in death by: her husband, Vernon; five siblings, Pauline Grieman, Raymond Michelson, Vivian Michelson, Allen Michelson, and Duane “Bud” Michelson; a granddaughter, Heather Johnson; and a grandson, Robert McIlrath. Mass of Christian Burial will be 11:00 a.m. Saturday, November 17, at St. Joseph Catholic Church in Raymond with burial to follow in St. Joseph Cemetery. Visitation will be from 4-7:00 p.m. Friday, at Hagarty-Waychoff-Grarup Funeral Service on West Ridgeway. To send flowers or a remembrance gift to the family of Beverly May Smith, please visit our Tribute Store. "Email Address" would like to share the life celebration of Beverly May Smith. Click on the "link" to go to share a favorite memory or leave a condolence message for the family.